Organic. Very low salt. Add taste, nothing else. Just the thing to make your soup sing!. Gluten and lactose free. No added MSG. No artificial colours, flavours or preservatives. Vegetarian, vegan and coeliac friendly. 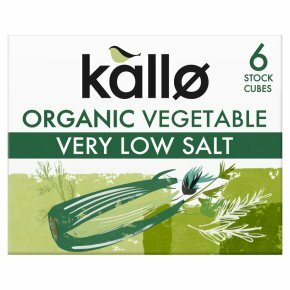 How to Use Dissolve one Kallo Very Low Salt Organic Vegetable Stock Cube in 500ml of boiling water and add to recipe.